Once again, it's time to clip in and ride. If you're a longtime reader of the site, thanks for coming back. I love the Tour, and I love chronicling the Tour every year here on TdFblog. If you're new to the site, welcome. I've been yammering about the Tour de France here since 2003, and following the race since the late '80s. In addition to long-form summaries and commentary here, I also do a multitude of race updates on Twitter, at @TdFblog. This year, I'm going to extend the empire even a little farther, with a Tumblr site for that content that's too long for Twitter, too short for the main site, and that's at tumblr.tdfblog.com. Don't be too surprised if that site is in rapid flux for the next few days, as I figure out what goes where, and figure out how to do things with Tumblr. Even though I'm tremendously depressed at the continuing scourge of doping in the sport, I'm really looking forward to this year's Tour. Last year's battle between Alberto Contador and the Schleck brothers looks to repeat. We'll see if Bradley Wiggins can fulfill the promise he showed finishing 4th last year on the new Team Sky. Cav's back, and brash as ever. And it looks like Big Tex is serious about retirement this time around, so it's the last shot for Lance Armstrong to win an 8th Tour. CSC-Saxo Bank struck the Luxembourg flag, posted Spanish colors, and opened up on the field on the Tour's queen stage today. Yellow jersey Fränk Schleck played the loyal lieutenant as Carlos Sastre put 2 full minutes into the whole field, with a dominating climb of l'Alpe d'Huez, the Tour's most famous climb. Meanwhile, Fränk and Andy Schleck shadowed Cadel Evans, covering every attack through switchback after switchback. Sastre launched immediately as the field left Bourg d'Oisans at the base of the climb. He was briefly joined by Rabobank's Denis Menchov, but a second attack dropped Menchov not only from Sastre's wheel, but from the yellow jesrsey group, as well. Menchov would claw his way back into that group well up the climb. While first Valverde, then Efimkin, then Vande Velde would try to escape the gravitational field around the Schlecks, every attack was pulled back while Sastre continued to climb into the yellow jersey, steadily building a lead of more than a kilometer on the road that was worth 2:15 to Evans, Menchov, and Kohl on the line. Even though Sastre looks to be in command right now, with the stage win and the leader's jersey, it seems unlikely he can hang within 1:35 of Cadel Evans on Saturday's long 53k/33-mile time trial. In the final TT last year, Evans made 2:33 on Sastre, even more than Sastre's winning margin today. 8. Denis Menchov, Rabobank, Russia, s.t. 9. Christian Vande Velde, Garmin-Chipotle, USA, s.t. 10. Bernhard Kohl, Gerolsteiner, Austria, s.t. VeloNews | Who won: Sastre or Evans? Spanish champion Alejandro Valverde showed tremendous power in closing down late attacks by Kim Kirchen and Stefan Schumacher and smoking to the first stage victory and overall leadership. 3) Jerome Pineau, Bouygues Telecom, s.t. 4) Kim Kirchen, Team Columbia, s.t. 5) Riccardo Ricco, Saunier Duval-Scott, s.t. 6) Cadel Evans, Silence-Lotto, s.t. 7) Fränk Schleck, CSC-Saxo Bank, s.t. 8) Filippo Pozzato, Liquigas, s.t. 9) Oscar Freire, Rabobank, s.t. 10) Oscar Pereiro, Caisse d'Epargne, s.t. It's the first day in yellow for Valverde, in his 4th Tour. He also leads the green jersey competition, which Philippe Gilbert will wear tomorrow. Valverde made time on all the contenders, from 1 second on Evans, 7 on Sastre and Menchov, up to 3:04 on Mauricio Soler, who crashed late in the stage. Thomas Voeckler takes the first King of the Mountains jersey, by finishing ahead of Bjorn Schroeder, with whom he's tied on points. 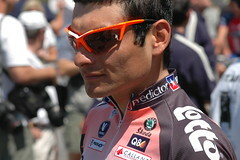 Riccardo Ricco is the first leader of the white jersey competition. Lillian Jegou was awarded the red most combative race numbers for tomorrow. First lanterne rouge is Aleksandr Kuschynski of Liquigas, 4:56 back. Active.com | Tour de France: Fast Freddie Rodriguez: Stage 11...Where Do I Start? Three-time US champion Freddie Rodriguez has been vocal about his concerns that Tour organizers should give more weight to rider safety when choosing the finish line of Tour stages. Once again, they’ve proven to have little respect for the rider’s health in this race. As a pro for over 10 years, I just don't get their ignorance in thinking that the peloton, coming in at 65 km/hr, was going to make it in one piece through an S-turn like that. I would have bet money that a crash would have happened in that corner. What the organizers keep forgetting is that we have no idea how dangerous the road is ahead at many points. We again put our lives in their hands, and again they have let us down. I guess the saddest part is that I have been trying to be vocal about their mistakes, but they seem to just choose to ignore. With a major hailstorm striking during the race, organizers shortened the day's stage, skipping the Nufenenpass, and restarting the stage at Ulrichen at the 95 kilometers to ride point. Some riders reportedly needed medical treatment from hail strikes, and some team cars were damaged. With the finish line just 1.7 kilometers below the day's last climb, the peloton's climbers had their eye on today's stage. Lampre's Damiano Cunego attacked on the slope, to be matched by (who else?) Saunier Duval's Gilberto Simoni. When the select group brought those two back, Simoni's teammate José Angel Gomez Marchante attacked, but Cunego countered (shadowed by Simoni), and as the top of the climb approached, it looked like the strong group of 8 riders, including two Vladimirs, Karpets and Efimkin, as well as Simoni, Cunego, and Gomez Marchante, would come down to a sprint. But Rabobank had a rider sitting quietly at the back of that group, fighting to hang on, and perhaps 200 meters before the top, Thomas Dekker gapped the leading group. Once over the top, Dekker streaked away on the downhill to the finish, going hard, tongue out, all the way to the 200-meter mark, when he finally felt comfortable sitting up, zipping the jersey, and enjoying the big win. Former race leader Frank Shleck managed to stay with the climbers until the day's last 5 kilometers or so, but lost 1:20 on the day, and passes the jersey to Caisse d'Epargne's Vladimir Efimkin. Dekker, the Tour of Romandy winner this year, said he was here starting his training for the Tour, and was surprised to feel so strong. Bennati holds the sprint jersey, while Alessandro Proni holds the King of the Mountains jersey. What Floyd Landis did today is all that even if you completely ignore his ride yesterday. Throw that in, and it's just incomparable. The analysis after yesterday's Landis disaster was that he was out, because none of the GC riders' teams would give Landis enough rope today. The problem with that analysis is that it didn't consider that Landis might just go out and take as much as he needed. That's what he did. Landis versus 142 riders today just wasn't a fair fight; the peloton needed more guys. “I want to win the Tour, whatever I['ve] got to do, if I had a bad day, I had to make up for it,” said Landis. I find myself wishing for the occasional 125-kilometer, 3-4 monster climb individual time trial. Subtitled “BEST. STAGE. EVER.” and featuring some excellent pictures from Ben Ross. Vila and de la Fuente are back with the lead group, which has encountered some rain on the way down to the village of Bourg d'Oisans. The gap to the peloton is 3:40. Vila and Cunego lead de la Fuente and the other escapees. Voigt is off the back of that group. He might be setting up to join Sastre near the foot of the climb. Zabriskie moves up and leads the break. He's showing off more moves than this morning (at right). Rabobank is working at the head of the field. Sergei Honchar has also been up front, and now Giuseppe Guerini, a former winner on l'Alpe d'Huez, has attacked from the yellow jersey's group. Roads have dried out, and it turns out Voigt crashed. He's back with the leaders now. It's a 3:13 gap with 15 kilometers to ride, and falling fast. The leaders are getting ready to climb. They've hit the climb, and Zabriskie is gone, Arrietta is gone. Chavanel, Garzelli, and Hincapie are at the back of the lead group, with Cunego and Lobato leading. De la Fuente has come off. There are 5 leaders: Schleck, Lobato, Cunego, Mazzoleni, and David Arroyo. Schleck leads, now Cunego comes around. Arroyo is falling away. Back in the GC group, there are 5 men: Landis loses his last teammate, and it's 4: Klöden, Rogers, Landis, Cadel Evans. Menchov isn't here, Pereiro isn't here. Up front Schleck and Cunego have ridden away; Mazzoleni and Logato have them in sight. Landis sits third wheel, and Menchov is back! Three other riders are 15 meters back, then there's a big gap back. Sinkewitz is well down in the field. Boogerd is just behind the Landis group, and probably Rasmussen with him. The Landis group isn't pushing the pace too hard, and may let Boogerd, Rasmussen and Leipheimer sneak back on. Klöden has pressed the pace, and Rogers is gone, and Menchov is gapped. Azevedo rides with Pereiro 25 seconds or less back. Klöden leads Landis, then Evans, with Menchov off the back, but likely to have Boogerd and Rasmussen's help momentarily. Pereiro is fighting, riding his own pace. He's got Chris Horner on his wheel. Menchov is 100 meters or so behind the leaders. Landis looks comfortable. Voigt fights to bring Sastre back up onto Menchov's wheel. Voigt and Sastre push the pace, and Menchov is falling behind Leipheimer, Voigt and Sastre. Voigt = major badass. With 10 kilometers to ride Schleck and Cunego have 2:50 on the Landis trio. Eddy Mazzoleni is climbing back up to the leaders. Landis takes the opportunity to gap Evans and Klöden, but Klöden goes right back up to him, but Evans can't. He's falling back! He's caught by Sastre and Leipheimer, who pass him easily. Mazzoleni has caught Cunego and Schleck. Landis and Klöden catch Vila, and now Euskaltel's Inigo Landaluze. Leipheimer and Sastre are closing down Landis and Klöden. The gap is no more than 5 seconds. The leaders lead Landis and Klöden by 2:35 with 7.2 kilometers to race. Landis is about to get some help: Leipheimer and Sastre have coupled up with Landis and Klöden, and they catch Merckx, and Landis attacks across to his teammate, takes one of Axel's bottles. and Klöden and Sastre match the attack, but Leipheimer is gapped. 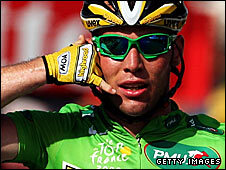 CSC named the nine men it hopes can lead Ivan Basso to his first Tour de France victory in July. It's a deep squad, featuring both guys not named “Armstrong” to wear the yellow jersey last year (Zabriskie and Voigt), 1998 Tour podium finisher Bobby Julich, and lots of love from Luxembourg: National champion (for at least another week) and 2006 Amstel Gold winner Frank Schleck, and 2006 Tour of Luxembourg winner Christian Vande Velde. Biggest surprise is probably the exclusion of Fabian Cancellara; he's probably a victim of the missing team time trial. “We are bringing a fantastic team to Tour de France this year. When you look at the names, you cannot help but notice, that this is a team to be reckoned with – a team which has the foundation to be one of the dominating ones in the 2006 edition of the Tour. We go to France this year with one ambition: To win with Ivan Basso. After his victory in the Giro, and with the training he has done in the period since then, I have no doubt he is ready for this next big challenge. He has the class, the willpower and also the team behind him to be one of the favorites,” adds Bjarne Riis. Jan Ullrich took a 2nd career Tour de Suisse win, winning the final stage time trial by more than 20 seconds over his nearest competition. Ullrich mastered the stage despite a heavy rain that started shortly before der Kaiser took to the streets. Nevertheless, Ullrich was 12 seconds up on race leader Koldo Gil at the first time check, and only got faster from there. Ullrich's victory in his preferred Tour de France warmup showed he could stay close to the climbers on the climbing stages, and that he's still the man to beat in a time trial. On a Tour route widely considered to favor time trial specialists, he looks well-positioned to take a second career Tour win. Davitamon-Lotto's Cadel Evans, active in the final stages of Saturday's Stage 8, was 2nd on the day, 22 seconds behind Ullrich. He was followed by Angel Vicioso of Astaná-Würth at 31 seconds, and Discovery Channel's Janez Brajkovic at 46 seconds and Ullrich's T-Mobile teammate Linus Gerdemann at 51 seconds. 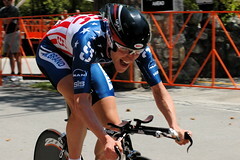 The best placed American was next: CSC's Christian Vande Velde, 6th at 52 seconds. Koldo Gil, who came into the day leading the race, with a 50 second gap to Ullrich, was a respectable 9th on the day, at 1:14, to save 2nd overall. Jorg Jaksche likewise slipped one place with a 10th place finish on the day. Brajkovic was able to move into the overall Top 5 with his excellent ride. Astaña-Würth's Alberto Contador attacked 33 kilometers out on the last major climb of the day to take the last road stage of the Tour of Switzerland. Cadel Evans tried to bridge up, attacking on a 4th category near the finish line to gap the surviving leaders, but never got within 20 seconds of Contador. He was joined by Euskaltel's David Herrero maybe 2k later. The pair was able to hold off T-Mobile's chase to the finish, and Herrero led Evans in for 2nd perhaps 3 seconds ahead of Gil, Ullrich, and the other leaders. Gil holds 1st on the GC. Jose Gomez didn't finish with the leaders, and will fall out of 6th overall. Cycling.TV's Brian Smith thinks Discovery Channel's Janez Brajkovic is a rider to watch tomorrow; he has a chance to move up against weaker time trialers. Simon Gerrans of AG2R is alone ahead of Rabobank's Michael “Spider” Rasmussen nearing the top of the final climb, long descent to La Punt to come. Jan Ullrich and Kim Kirchen of T-Mobile, Koldo Gil and José Gomez of Saunier Duval and Jorg Jaksche of Astaná-Würth are chasing. José Gomez goes off the front, gets 25 yards, and Ullrich matches it, but loses Kirchen off the back. Now Koldo Gil takes his turn, and he's immediately put 10 seconds into Gomez, Ullrich, and Jaksche. Now Gil and then Gomez, Jaksche and Ullrich have pulled by Michael Rasmussen as if he's riding backwards. Only Gerrans is still up the road. Overall leader Angel Vicioso is about 1:40 back of Gerrans, but Gil is less than 20 seconds behind with 2 kilometers to climb. Ullrich's group is maybe 30 seconds behind Gil. Gerrans is caught. Now it's just Gil riding for the stage win and race leadership. He's got 1:36 on Vicioso's group, and :37 on Ullrich, Jaksche, and Gomez, who is occasionally getting gapped off the back of the German pair. Jaksche has 6 seconds on Gil in the GC, but Gil has gone out to 40 seconds on the road. Gerrans has caught on with Ullrich, and now Gomez and Gerrans are dropped. It's Ullrich and Jaksche attacking together as Gil goes over the top of the climb. Vicioso, Giampaolo Caruso, Frank Schleck and Janez Brajkovic of Discovery Channel go over the top at 1:50, working together but losing time on the half-dozen riders ahead of them. We'll see if anyone can make up time on the 7 kilometers left to descend. Ullrich and Jaksche are at 34 seconds with Gil at 4 kilometers to ride. Looks like Gil will stay away, and will take the race lead — the Germans are at :35, with the yellow jersey group with Vicioso at 1:56, while Gil is in the last 2 kilometers. Gil is riding hard all the way to the line, pumping hard in the last 100 meters to get every second, and he takes the stage win. Meanwhile Jaksche has attacked to gap Jan Ullrich. He's got 3-4 seconds on Ullrich, and he comes in around 36 seconds. Ullrich is at :40. Here comes Gomez for 4th at 1:39; Gerrans 5th at 1:48, Schleck is leading in the yellow jersey, at 2:07 with Brajkovic, Caruso, and Vicioso. Linus Gerdemann is coming in with another Saunier Duval - he'll fall back out of his 3rd overall, coming in at about 3:28. The overall top 5 will be Gil, Jaksche at :34 Ullrich at :54, Gomez at 2:00, Vicioso. Ullrich is right where he needs to be. Even though he's 3rd overall, he can probably take all the necessary time out of Gil and Jaksche on Sunday's time trial, and there's still a lot of racing before that. With 5 kilometers to ride, Discovery Channel's Jurgen Van Goolen and Phonak's Steve Morabito have almost 2 minutes on the surviving pack. T-Mobile is driving a peloton that's constantly shrinking, but still has 30 or so riders. Jan Ullrich is here, Giuseppe Guerini is doing a lot of work for T-Mobile. Race commentators aren't sure if Linus Gerdemann is here — he's 2 seconds out of the race lead right now. With just over 3 k, Morabito launches, but Van Goolen matches his effort. Still in no-man's land is Kjell Carlström of Liquigas and Alexandre Usov. Usov is caught. Calrström has only 15 seconds on the T-Mobile train. The 2 leaders are down to 1:16 lead with less than 3 kilometers to ride. Leaders go under 2 k and back in the field Alberto Contador launches! He's caught Carlstöm, and they've formed a duo. Carlstöm's out of gas, he's no help for Contador. A Saunier Duval rider has attacked across to Contador. The two leaders have less than a kilometer to ride. Morabito is lead wheel, Van Goolen comes alongside, now Morabito sits in on Van Goolen, and with less than 300 meters, Morabito slingshots powerfully away from his breakmate, and it's a win for the Swiss! Van Goolen barely survives to take 2nd ahead of a charging Alberto Contador. Ullrich is 6th, Bettini is here, Frank Schleck is among the leaders, Angel Vicioso, yesterday's winner, Jorg Jaksche, and Gerdemann are all here, but no race leader Nick Nuyens, so Astaná-Würth's Vicioso moves into the leader's jersey, ahead of Jaksche and Gerdemann. By the way, Astaná-Würth is still riding in the “We're not Liberty Seguros” jerseys, with the white chest and Würth on the stomach, side panels, and sleeves. QuickStep's 26-year-old Nick Nuyens kept the freshest legs in a late-stage breakaway Monday to take the 3rd stage of the Tour de Suisse. As a teammate of Paolo Bettini, also in the selection, Nuyens didn't work as hard to make the break stick, and easily outkicked T-Mobile's Linus Gerdemann, Astaná-Würth's Jorg Jacksche, and Saunier Duval's Koldo Gil. T-Mobile's Jan Ullrich was near the front for most of the day, and he, Bettini, Cadel Evans, Frank Schleck, David Canada, Giampaolo Caruso, and the 4 who would break away formed a superstrong group of 10 with about 20 kilometers to ride. Michael Rasmussen, Bradley McGee, and Robbie McEwen were shelled by the high tempo, and came in around 4 minutes back. CSC's Luxembourg champion Frank Schleck has been in more breaks this season than Allan Iverson. Sunday, he took it to the hoop. Schleck attacked out of a 10-man break with 9 kilometers to ride, to beat Steffen Wesemann of T-Mobile and perennial Amstel podium finisher Michael Boogerd of Rabobank. Shleck is the first Luxembourgian to win Amstel, and the first to win a classic since Marcel Erzner took Liége-Bastogne-Liége in 1954. T-Mobile had three men in the lead group late, but Wesemann couldn't match Schleck's move. Pre-race favorite Paolo Bettini of Quickstep was 8th on the day, back 53 seconds. Somebody noted the youth movement apparent in the classics so far, with Boonen, Cancellara, and Schleck all 26 or less. Don't forget OLN has same-day coverage of Amstel Gold this afternoon on Cyclysm Sundays. 6) Davide Rebellin, Gerolsteiner, s.t. 7) Miguel Martin Perdiguero (Spa) Phonak, s.t. PezCycling News | Milano-Sanremo 2006: New Prince Crowned in Primavera! I just finished watching the OLN coverage of Milan-San Remo. What an awesome race. Filippo Pozzato played it exactly right both strategically and tactically. Reading the live text feeds on the web, I couldn't tell whether the Frank Schleck group with Sanchez and Pozzato got swallowed up or not, and now I see why. The peloton made contact with the six leaders, who were fighting every inch of the way, so instead of the typically engulfing end to the break, the break members stayed out at the tip of the spear. As Milram tried to set up its finishing sprint, coming around the break remnants, Igor Astarloa (the OLN commentators thought it was Rinaldo Nocentini of Acqua e Sapone) just put the hammer down. Pozzato not only caught him, but came around him, charging super hard, and the gap held up. Astarloa wound up 11th. If you watched the TV coverage, VeloNews fingers Ivan Gutierrez as the Caisse d'Espargne rider trying to wave off the motorcycles -- he thought they were hovering a little too close to Petacchi's chasers, giving the peloton a bit of a draft. "I was in top form, but I didn't have the luck today," Petacchi said. "You need to have the luck to win Milan-San Remo. Our team rode great today and I wanted to pay back their efforts with a victory. But my compliments go to Pozzato. Quick Step worked the tactics perfectly with Pozzato on the wheel and they left the chase up to us." 3) Luca Paolini (I), Liquigas, s.t. 4) Tom Boonen (B), Quick Step, s.t. 5) Danilo Napolitano (I), Lampre, s.t. 7) Stefano Garzelli, Liquigas, s.t. 8) Alessandro Ballan, Lampre, s.t. 9) Martin Elmiger, Phonak, s.t. 10) Matteo Carrara, Lampre, s.t. rec.bicycles.racing | What's written on Pozzato's right arm? If you check out the left-hand image above at GrahamWatson.com (just click through), you can see that Sanchez at right isn't too happy with Pozzato disrupting the break's rhythm. Euskaltel-Euskadi were having an atrocious season. Now, after Inigo Landaluze grabbed victory at the Dauphiné Libéré and Aitor Gonzalez turned up the heat on the hardest stage of the race to win the Tour of Switzerland, the Basque team looks like a team to watch in the mountains at the Tour de France. Gonzalez drove the train on Saturday, when Pablo Lastras took the stage win, but on Sunday, he was riding with the overall in sight. Gonzalez escaped on the Ulrichen-Ulrichen stage (no relation), attacking about 1 km into the climb of the Furka Pass, and quickly put Jan Ullrich in difficulty. Michael Rogers was able to hang with Jens Voigt and Frank Schleck, who together dropped Ullrich, who rode his own pace for the rest of the stage. Rogers never closed down Gonzalez, despite Schleck, Atienza, Chris Horner, and Leonardo Piepoli riding alongside for the last part of the climb, and most of the descent, so Rogers dropped to 2nd on GC. Schleck had a chance to kick Ullrich off the podium, while Horner stood to climb well up the standings. Schleck didn't get the time he needed, finishing 4th, 5 seconds behind Ullrich, but Horner did move up to a 5th place overall, at 2:02 behind Gonzalez. "I'm happy with my Tour de Suisse," said Ullrich in a brief statement before disappearing into his team's bus. "It was a beautiful race, and it was good preparation for the Tour de France, which was what I intended." Cyclingnews spoke to a bitter Michael Rogers after the finish, and asked whether he was satisfied with the fact that he did everything he could today. "Yeah, but really disappointed," said Rogers. It seemed only Horner was helping you? "Yeah, well, Horner had his own objectives."